The "Dinosaur Land" peel and stick cut outs will make a great addition to any little boy's room. Your kids will roar with delight over these prehistoric pals! 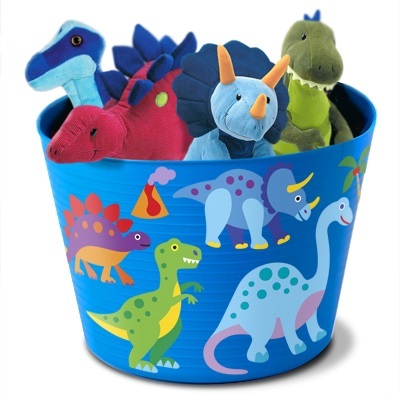 We've included eight dinosaurs (2 sets of four) that are brightly colored and cute. There's also foot prints, a dino bone and a volcano. 18 pieces in all. Make a little boy happy with a Dino Land Adventure! - Eighteen pieces ranging in size from 5.5 inches to 3.5 inches. - The T-Rex is about 6.5"" tall.